The Chalukyan were great patrons of art. The Vesara style in the building of structural temples was developed by them. However, only under the Rashtrakutas and the Hoysalas, did the Vesara style reached its culmination. The Structural temples of the Chalukyas exit at Aihole, Badami and pattadakal. Cave temple architecture was also famous under the Chalukyas. Their cave temples are also found in Ajanta, Ellora and Nasik. The First stage is represented by the temples at Aihole and Badami. Among the seventy temples found at Aihole, four are important. 1. Ladh khan temple is alow, flat-roofed structure consisting of a pillared hall. 2. Durga Temple resembles a Buddha Chaitya. 3. Huchimalligudi temple at Aihole. 4. The Jaina Temple at Meguti. The second stage is represented by the temples at pattadakal. There are ten temples here, four in the Northern style and the remaining six in the Dravidian style. The Papanatha temple is the most notable in the Northern style. The Sangamesvara temple and the virupaksha temple are famous for their Dravidian Style. The Virupaksha temple is built on the model of the Kailasanatha temple at Kanchipuram. It was built by one of the queens of Vikramaditya II. Sculptors brought from Kanchi were employed in its construction. It is located in Hampi, Karnataka on the banks of the Tungabhadra River. 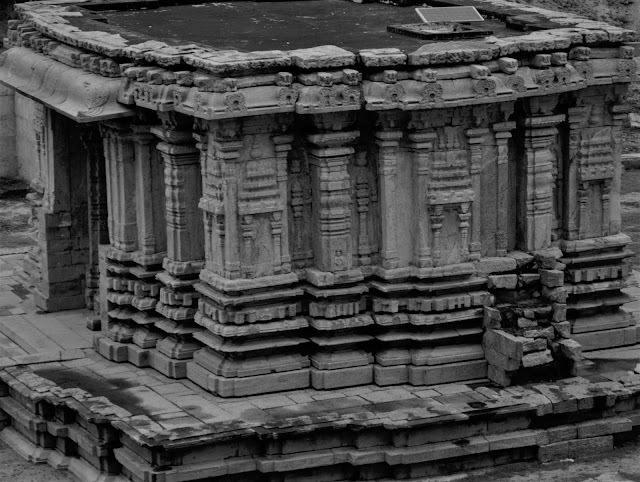 After Succeeding the Chalukyas, the Hoysala rulers evolved a new style of Architecture. The most notable temples of this period are those constructed in Belur, Halebid and Somnathpur. • The base of the temple is star shaped and not square shaped. • Open mandapa, closed by a compound wall. • Miniature shrines within the compound wall. • Temple wall profusely decorated with royals, sages, dancers and even Kamasutra figures. • Two vimana and three vimana structure-made from single granite. This temple is located in Talakkad near Mysore, in Karnataka. It was built by the Hoysala king Vishnuvardhan. This temple is known for a single granite vimana, a huge statue of Nandi open mandapa garba griha. In recent years, the ASI has resorted this temple. 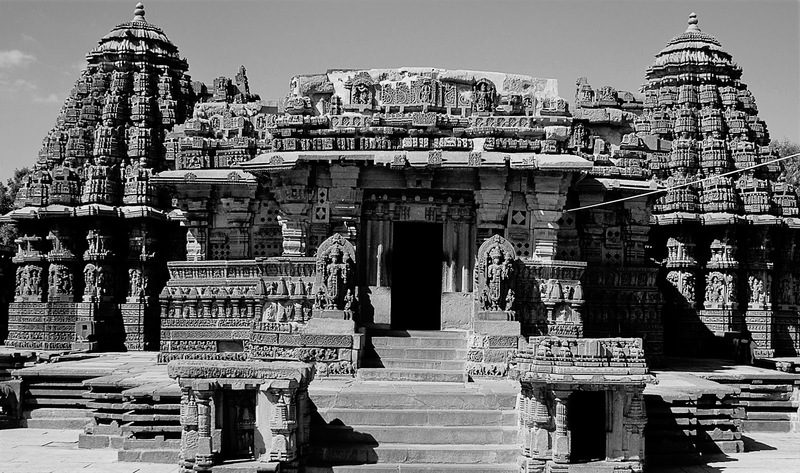 It was built by Vinaditya Ballal in about AD 1043 and is the earliest of this type. The temple though small was exquisitely carved with three pyramidal vimanas surmounting the three shrines. It is located in Halebid in Hassan districts, Karnataka. Built of grey soap-stone, best suited for fine carving, each of the temples has star shaped vimanas with projections of its three sides. It is located in Benur and was built by Vishnuvardhana of the Hoysala dynasty in AD 1117 to commemorate a victory won over the cholas its Talkad in AD 1116.